Flybe’s new service between Aberdeen International Airport (AIA) and London Heathrow took to the skies yesterday, creating competition on the key route for the first time since autumn 2015. The airline’s three daily round-trips between the Granite City and the UK’s busiest airport each weekday, plus one on Saturdays and two on Sundays, marks its debut at the London hub. It is also flying between Edinburgh and Heathrow in a battle for business with flagship operator British Airways. North-east passengers travelling on from Heathrow to any one of the Star Alliance network of 44 global destinations or other locations with Flybe codeshare partners Emirates, Virgin, Etihad and Singapore Airlines can fly on just one ticket. The same can be done in reverse, making it easier for business and leisure travellers from around the world to visit Aberdeen city and shire. Scotland Transport Minister, Humza Yousaf said: “It’s fantastic to see these new Flybe services from Edinburgh and Aberdeen to London get off the ground and I have no doubt they will prove popular with travellers. Gordon SNP MP Alex Salmond added: “It is crucial that the people of Aberdeen and the north-east are conveniently connected. 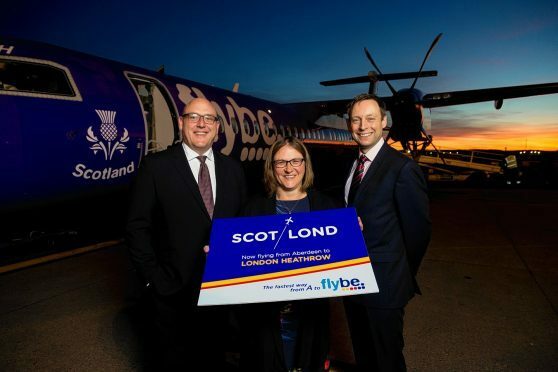 “This trio of daily Flybe routes from Dyce will provide another option for travel and business, and will certainly be one I use on my weekly visits to Parliament. “These routes are good news for Scotland and for Britain as a whole in delivering better regional connectivity to important global markets,” Lord Ahmad added. Heathrow operations director and former AIA managing director Derek Provan said the London airport’s recent move to cut passenger charges by £10 was a boost for both new routes. Virgin Atlantic’s Little Red services from Aberdeen and Edinburgh to Heathrow were axed in late 2015, just two-and-a-half years after start-up.